Dimenzije: 19,50 x 27,00 cm. Opseg: 223 + 245 + 167 stranica. Uvez: tvrdi, platneni, zlatotisak na koricama i hrptovima. Stanje knjiga: vrlo dobro, uredne. 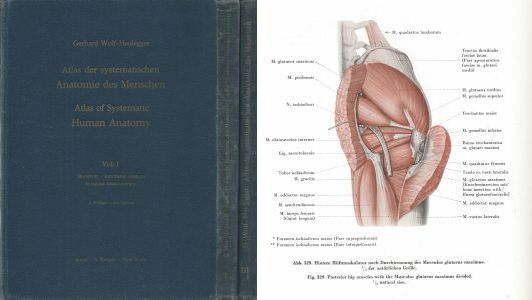 Puni naslov: Atlas of Systematic Human Anatomy / Atlas der Systemantischen Anatomie des Menschen. Anatomski nazivi na latinskom jeziku, legenda na njemačkom i engleskom jeziku. Vol. 1: Skeleton - Iuncturae ossium. Systema musculorum. S 352 ilustracije, većinom u boji. Vol. 2: Splanchnologia. Organa sensuum et integumentum commune. Cor et lien. S 343 ilustracije, većinom u boji. Vol. 3: Systema nervorum. Vasa sanguinea et lymphatica. S 172 ilustracije, većinom u boji. Second Edition - drugo izdanje. The necessity for a new edition of the first volume of this Atlas became evident at a time when the author and medical illustrators were fully occupied with the last of the three volumes. Nevertheless, it has been possible to replace or alter some features which for one reason or another were not considered adequate. The opportunity has also been taken of adding five new plates (Nos. 2, 232, 233, 246 and 247), but other desirable additions have had to be deferred. I am most grateful to my colleagues for their friendly reception of the first edition of the Atlas, as also for their helpful criticisms, which have been most valuable in deciding what changes should be made and what new material included. As in the first edition, the new plates have been drawn by my esteemed collaborators Messrs. Adolf Dressier, Rolf Muspach and Robert Schlumpf. The change in this revised edition to the new international Paris nomenclature has involved a great deal of work. Despite serious linguistic and practical objections to some of the new terms and despite its manifest incompleteness, we consider it worthwhile encouraging this attempt to establish an international system of anatomical nomenclature. Terms which do not appear in the new nomenclature and the inclusion of which seems to us to be desirable are enclosed in square brackets. As in the first edition of the third volume of this Atlas, terms regarded as inappropriate have been replaced by others more suitable and more in keeping with the humanistic background.